we stayed to watch fountain show and it was very right choice. Dubai mall is also walking distance. staffs are friendly and attentive. recommended to tourists who want to enjoy fountain show for whole night. The rooms are very generous however the check in experience was dreadful. Our booking included request for non smoking rooms (2 separate bookings for differing dates and durations) but both included non smoking and bedding. The first room offered was smoking - could not even enter the room. The second room had a kng bed when twin was requested and was also smoking. On third attempt we were offered the room we requested. The second ( I arrived a few days later) was to be non smoking and requested a high floor. My wife who arrived with earlier booking had requested rooms on the same floor. The first room offered was on level 4 - not a high floor - after complaining it was moved to level 25. So we had our daughter on level 8 and ourselves on level 25. NOT GREAT SERVICE and not an apology or anything. Over all we had booked two rooms totaling 7 nights and treatment was average. However the location is good, taxis were plentiful and many restaurants nearby. I have stayed here 4 or 5 times and I have tried different types of suites. This one which is city view was the best one. The carpet color gets to me everytime but still Id say on the whole a very comfortable setup. In winters I always get stuck with its heating and could not get proper heating out of the controls but I guess i was doing something wrong. Location is just a very nice stroll around the waters to Mall of Dubai. The reception staff service is superb! But there is some confusion that they put someone else baggage in our room. Room is big , clean and comfortable. Walking distance to Mall and nice view of Burj Khalifa and water fountain, however, the weather is too hot to walk on the streets. Great value for money . Staff were exceptional especially Victor at the conceige and Julius at breakfast. A short walk to the Mall and music fountain. Glad we stayed one night in Dubai before going on to London. We stayed 5 nights in the Ramada Downtown because of its position. Our son lives 2 minutes walk away and his flat is too small for us to fit comfortably so the hotel was a great option. The position in Downtown is very good, being adjacent to the lake close to the Opera House park and an easy 10 minute pleasant walk to Dubai Mall - OK even in summer after about 4pm. There is a very pleasant pool and a small children's play room which was great to entertain our small granddaughter. The basic rooms are very spacious, having a large living area, well equiped kitchen area (with dishwasher and washing machine!) and large separate bedroom with very comfortable bed. All was very clean and quiet (we were on 22nd floor). 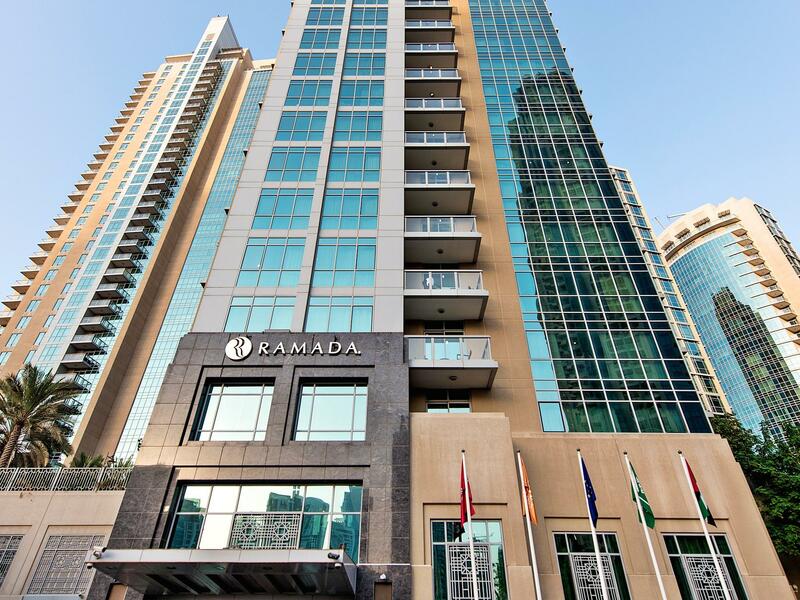 We have recommended the Ramada for other family members staying. From the arrival to the check out the hotel was ideal for us. The location for what we wanted to do was perfect and being where it was is pretty central to where the action is. We had a city view, yet we got some view of the Dubai fountain from our room which is a breathtaking show. The hotel itself was in good condition and the staff were all helpful to all our needs in particular the hotel manager Mr Khan. This guy was everywhere and made us feel like home! Mr Khan paid attention to our kids and their needs. overall our 3 night stay was a very comfortable stopover coming back from Italy towards Australia. the hotel runs a shuttle service to the Dubai mall which runs a few times during the day and also to other parts of Dubai. We found this very useful. the mall is where the aquarium is and everything you need to see in regards to retail. We would recommend this hotel to everyone and will definitely stay in this hotel when stopping in Dubai. This is what hospitality should be!! We went in September so rates were still very reasonable. 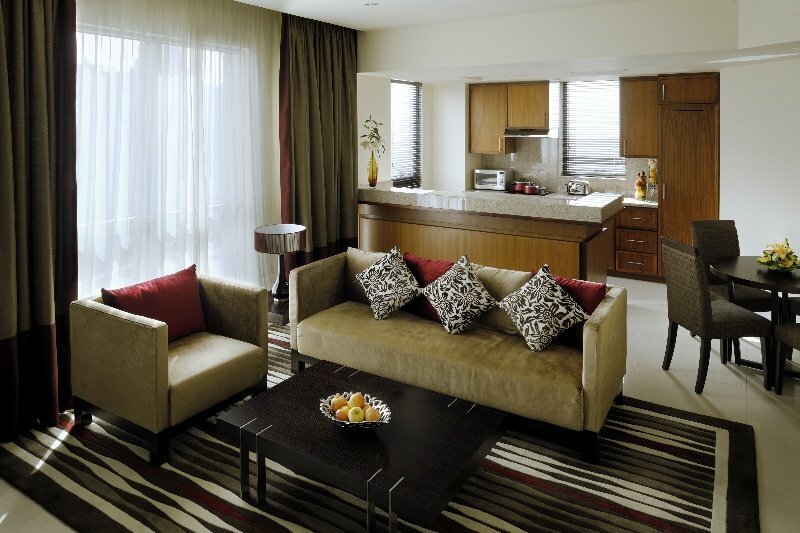 I was very pleased with the suite and staff was always very accommodating when I had requests. They are very prompt with their shuttle and helpful in booking any tours you might want to take. The downtown location was good. There is a grocery store very close and with a kitchen in the suite we had breakfast in every morning. The staff there is very kind and very useful. They gave me a room with a very nice view to Plaza and Burj Kalifa and Dubai's Mall and Opera House. It is really good value for money, they even organised transport to the Mall and some other touristic spots. The room is very spacious, the conditioning can work in a split mode, you can leave it run in the kitchen area, the food in the restaurant especially breakfast is really good. The best things are staff, location and the most importantly VALUE for money. Standard room is a large apartment with big double bedroom large bathroom with bath and good shower. Full kitchen with washing machine and cooker large living room. Good size outdoor pool. We stayed in Fountain View room at higher floor for 3 nights, Stay was good, they provide kitchen facilities with this room, referigerator to strore things, its totally worth the money. Talking about surroundings there is some constrcution going on right in front side of hotel building which is a bit noisy in night but it is bearable. On the other side of hotel which faces burj khalifa tower, dubai mall and the fountains is absolutely stunning. Dubai mall is at walking distance of 10 minutes which passes through the opera house and the fountains so you dont really feel discuouraged of walking n going becuase of the view you get on the way. overall a good stay, stunning view from fountain view suite room in the day or during night. 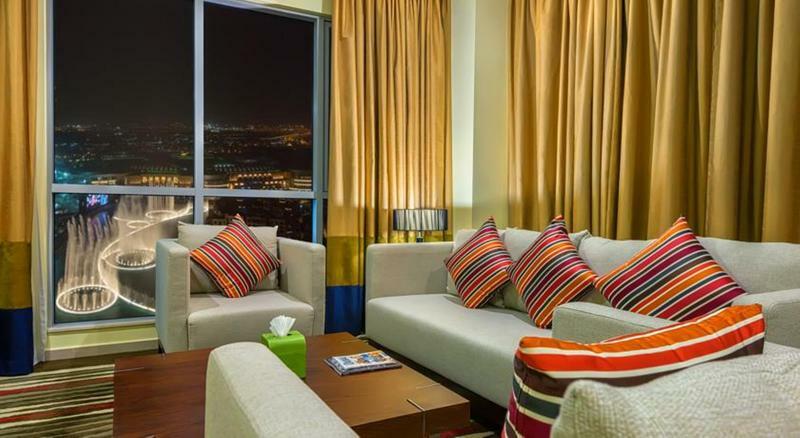 Its a 10-15 minute walk from mall of dubai (burj khalifa fountains). The rooms are quite big (unlike the traditional small room hotels), which was very convenient with our 3 year old. The food is available from room service 24/7 (another very big advantage). We used to come late after site seeing and could order food even very late. Our hand shower developed a leak and it was fixed within 15 - 20 minutes. Very quick. There was a kitchen in the room we booked. This was super convenient for making small things for our little one. They had a full sized fridge, which could hold 1.5 - 2.5 litre water bottles. Another thing which we found convenient. I would definitely stay here again. I dont usually giving a review, but Ramada is an exception. Friendly and helpful staffs, spacious clean room with very very reasonable price, and great location (8 minutes walking distance to Dubai Mall). Very very recommended! Everything about this hotel was perfect. Its location was excellent. Hotel is a family hotel. Staff were very friendly to family with little children. Located downtown area and very accessible to restaurants, supermarket and pharmacy. The view of Burj Khalifa, Fountain and Dubai Mall was priceless. สถานีรถไฟใต้ดิน Business Bay - ระยะ 1.29 กม.